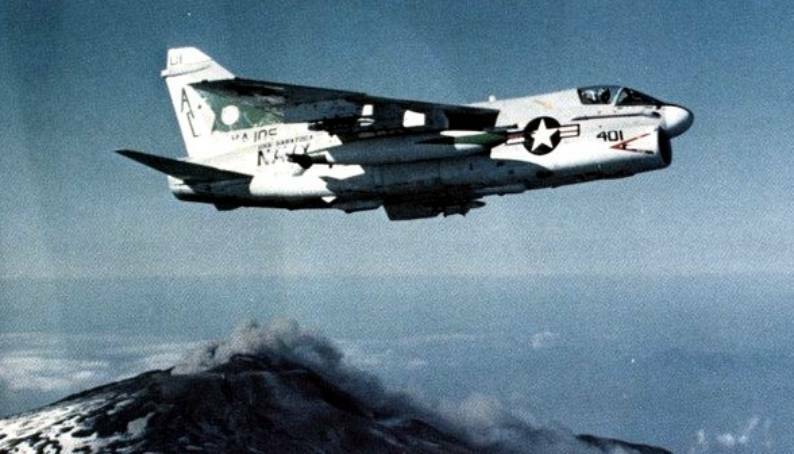 The second Attack Squadron 105 (VA-105) was established on 1 November 1967 at NAS Cecil Field, flying the new A-7A Corsair II. 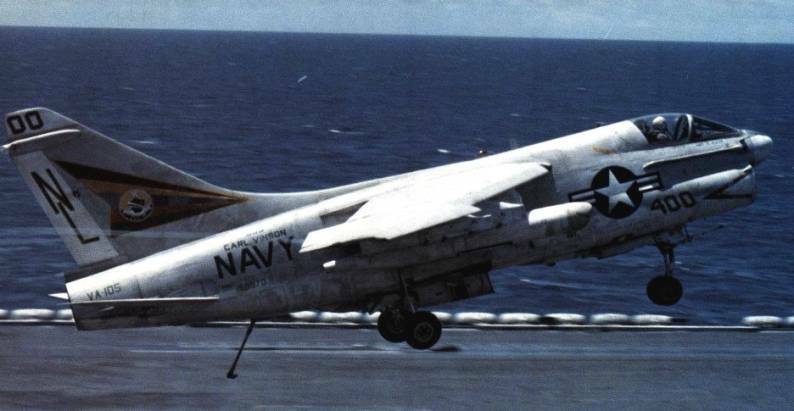 On 4 March 1968 the squadron completed A-7A training under VA-174 and became an operational Atlantic Fleet unit. 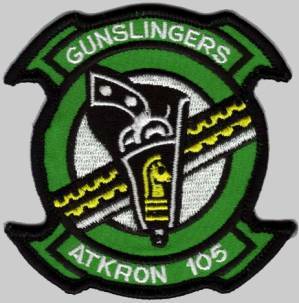 The "Gunslingers" embarked on their first deployment to Southeast Asia aboard USS Kitty Hawk (CVA-63), participating in combat operations in the Gulf of Tonkin from January to October 1969. Following the shootdown of a Navy EC-121 by the North Koreans in April, Kitty Hawk was part of a continuing American presence being maintained off the coast of Korea. 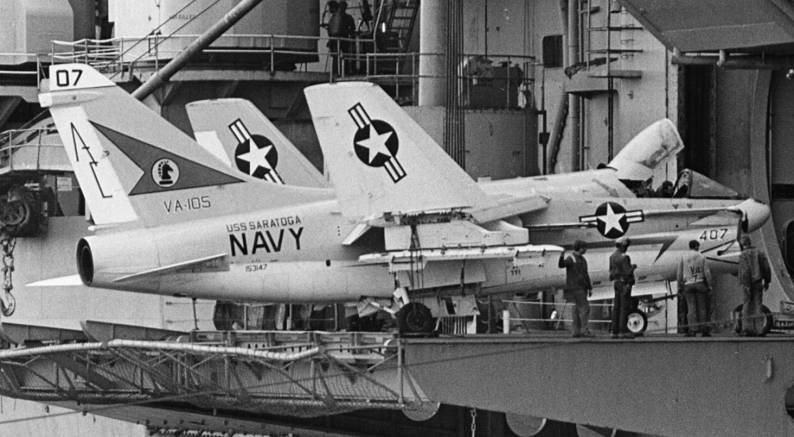 In Sep and October 1970 following the hijacking of several airliners by Palestinians, the outbreak of serious fighting in Jordan and the invasion of Jordan by Syria, USS Saratoga (CVA-60), with VA-105 embarked, operated in the eastern Mediterranean, prepared to support an evacuation of Americans from Jordan and to show support for the Jordanian government. In June-December 1972, the squadron participated in Linebacker I and Linebacker II operations, heavy air strikes against targets in North Vietnam to interdict the flow of supplies into South Vietnam. 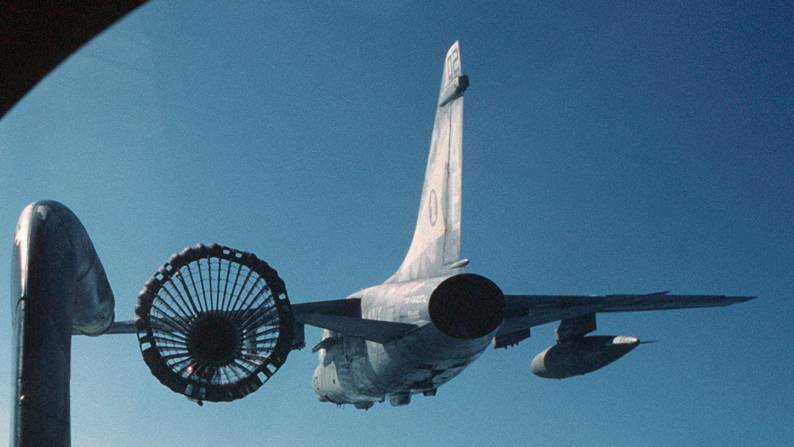 In May 1973, the squadron upgraded to the A-7E. 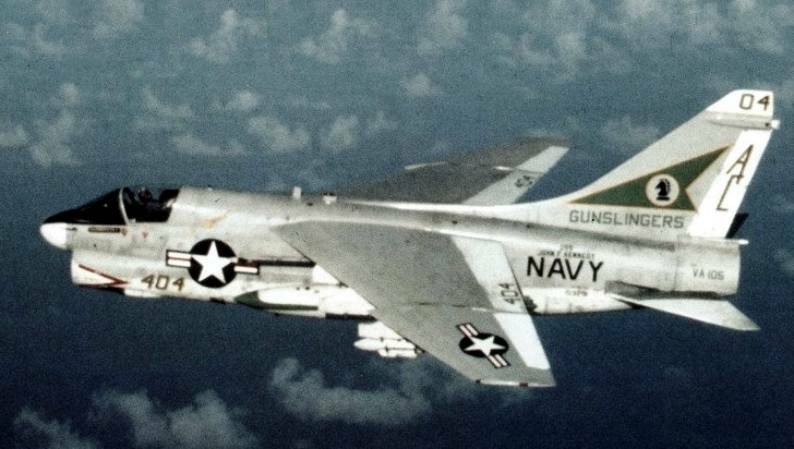 As of December 1979 the "Gunslingers" had two Western Pacific and six Mediterranean deployments to their credit. 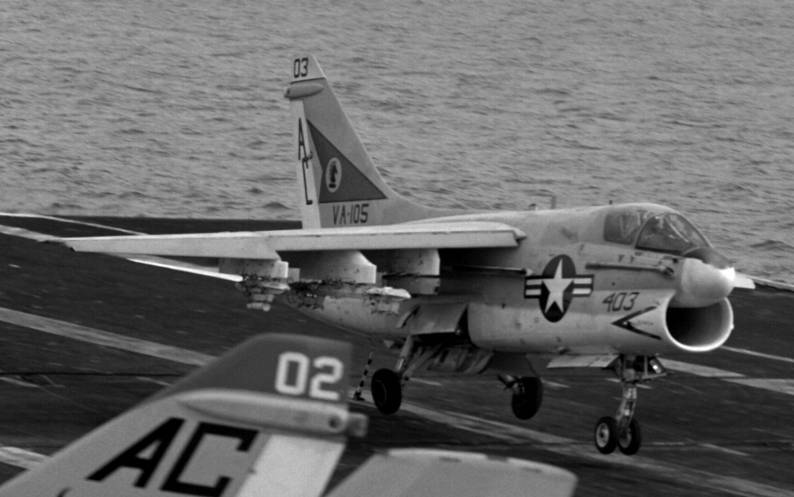 In June 1982 following the invasion of Lebanon by Israel, VA-105 operated from USS John F. Kennedy (CV-67) to support an evacuation of Americans. From July-December 1984, the squadron deployed to MCAS Iwakuni, assigned to MAG-12, 1st MAW. This was the first time a Navy squadron participated in the United States Marine Corps Unit Deployment Program (UDP) and the first Navy squadron since World War II to come under the command of a Marine Corps officer. While deployed with the Marines the squadron’s major mission was close air support. 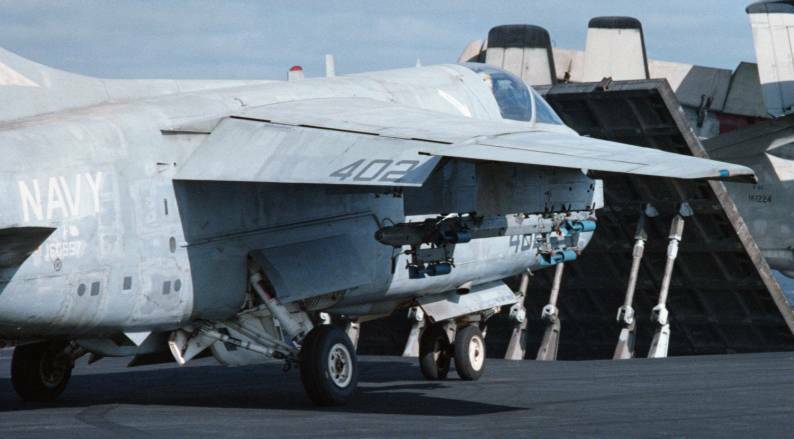 During the '80s, the Gunslingers completed eight overseas deployments, including six to the Med, and a 1983 around-the-world deployment aboard the USS Carl Vinson (CVN-70). 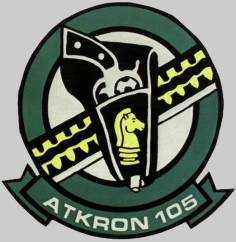 VA-105 was redesignated Strike Fighter Squadron 105 (VFA-105) on 17 December 1990, as the squadron transitioned to the F/A-18C. 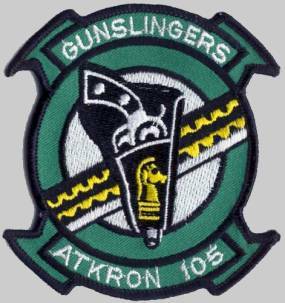 The "Gunslingers" reported to CVW-3 aboard the USS John F. Kennedy (CV-67) on 1 September 1991.